?There are a lot of Beatles tribute bands all over the world and I?ve seen them all, but The Mersey Beatles are the best I?ve heard.? So said John Lennon?s Sister, Julia Baird in 2008. Since then Liverpool?s favourite Beatles tribute band, voted as best Beatles band by the British Beatles fan club, have racked up over 3500 Performances at the Cavern Club alone. They have headlined festivals and events the world over. So busy were they with overseas tours they had to leave their Cavern Club residency in February 2012. After 10 years in the role as the one and only resident Beatles band and the world?s most famous club, it was emotional farewell. On returning to the UK they were welcomed back to The Cavern Club where they still play to this day. 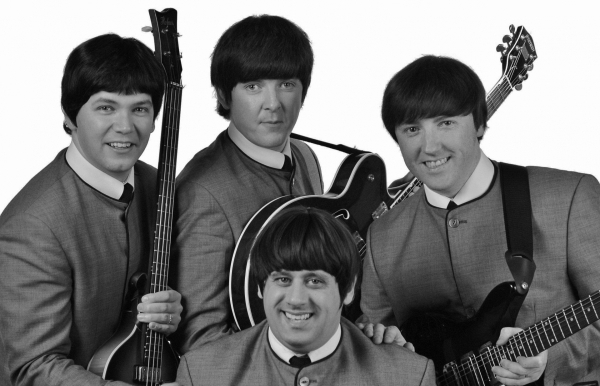 The show consists of all era Beatles classics in full costume. From ?Love me do? to ?Let it be? via ?Beatlemania? and ?Pepperland?. Like the original Fab Four, The Mersey Beatles are Liverpool lads born and bred. No phoney accents needed, no script required. They react and interact with the audience in the relaxed and natural way of their role models and all the songs are performed in the original recorded key. When all of this is put together it means the best music ever made is performed with the spontaneity, energy, excitement and respect which this fantastic music deserves. All your favourite Beatles classics in one concert.